The Ambassador-designate of Sri Lanka to the Federative Republic of Brazil, Musthafa Mohamed Jaffeer presented credentials to President Michel Temer at the President’s Planalto Palace in Brasília on, 5 September. The credentials ceremony followed a brief meeting with President Temer, an official photograph and an honour guard. The Minister of Foreign Affairs Aloysio Nunes Ferreira and the Chief-Advisor of the Special Advisory Office of the Presidency of the Republic Ilimar Franco da Silva were also present at the credentials ceremony. At the event, President Temer warmly welcomed the new Ambassador and extended his good wishes for the latter’s successful tenure of office in Brazil. Noting the warm bilateral relations that exist between Brazil and Sri Lanka, the President underscored the need to further expand the cooperation and friendly ties between the two countries. Ambassador Jaffeer thanked President Temer for his warm and positive sentiments expressed toward his country and conveyed President Maithripala Sirisena’s greetings and good wishes to the President of Brazil. 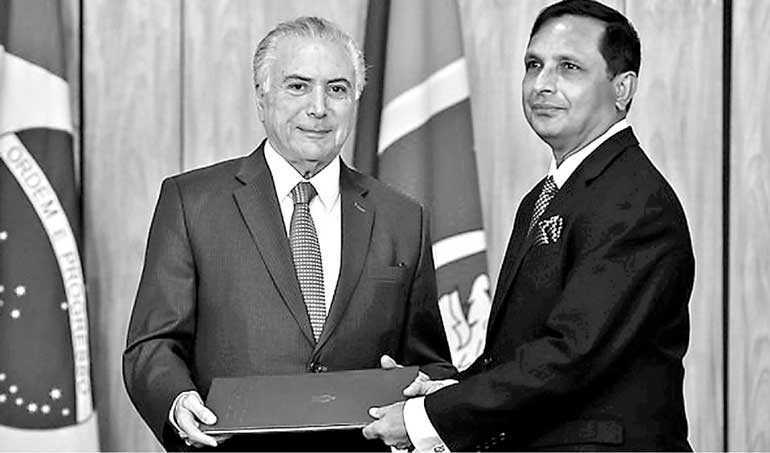 The Ambassador further expressed Sri Lanka’s deep appreciation to the Federative Republic of Brazil for the support extended to Sri Lanka in bilateral as well as in multilateral areas. On this occasion, he also assured the President that he would endeavour to explore more avenues to expand the ties between the two countries for the benefit of the two peoples during his term of office. Before the Ambassador took leave from the President, he also signed the guest book at Planalto Palace. The Ambassador was accompanied by his spouse and Minister, Theshantha Kumarasiri. After assumption of duties at the Embassy on 31 August, Ambassador Jaffeer also called on Ambassador Marcos Bezerra Abbott Galvão, Secretary General of the Ministry of Foreign Affairs of Brazil. At that meeting, he highlighted Sri Lanka’s keenness to expand its relations, especially in economic, trade, investment and technical cooperation areas with Brazil. The Ambassador also appraised the Secretary General of the strategic position that Sri Lanka has assumed following the Government’s revitalised economic and development policies and strategies. In this regard, the Ambassador suggested that Brazilian business enterprises could take advantage of the positive environment that prevails in Sri Lanka to gain a foothold in the country as well as in the region. Ambassador Jaffeer joined the Sri Lanka Foreign Service in 1988, and has served as Sri Lanka’s Ambassador to Norway, Austria and Vietnam. He has held several senior positions in the Ministry of Foreign Affairs of Sri Lanka including the Additional Secretary/Multilateral Affairs, Chief of Protocol and Director General/UN, Multilateral Affairs and Conferences.